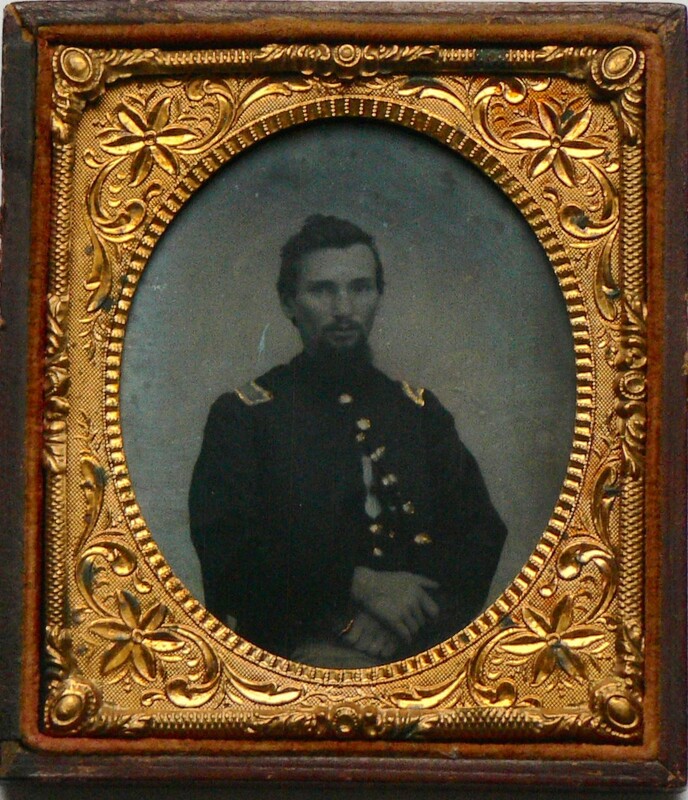 Edwin Alonzo Stebbins interrupted his dental practice to enlist in the Vermont Volunteers in 1862. Serving in the 11th Regiment, Company G, he assisted in the Defenses of Washington, D.C. He was appointed to the position of Corporal when he first entered the service, and left as a 1st Lieutenant in 1865. He spent his post-war years in West Townshend, Vermont and primarily in Shelburne Falls, Massachusetts, where he continued his work as a dentist and raised a family. Illness dogged Stebbins throughout his service, beginning with chronic diarrhea and jaundice in 1862. He died of Bright's Disease (kidney disease) in 1896. Though coming many years after the war ended, his death may have been precipitated by conditions during the war, according to Stebbins' pension file. In his own declaration, he stated that he suffered from rheumatism, heart disease, kidney disease, and lameness in his foot as a result of his experiences in the Shenandoah Valley in 1864 with his regiment. Today, medical research can tell us much more about the causes of disease than was known at that time. However, it does seem possible that infections he contracted during the war, or medications containing mercury or other dangerous substances which he may have taken for his illnesses, could have contributed to his kidney disease. He is buried at Arms Cemetery, Shelburne Falls. 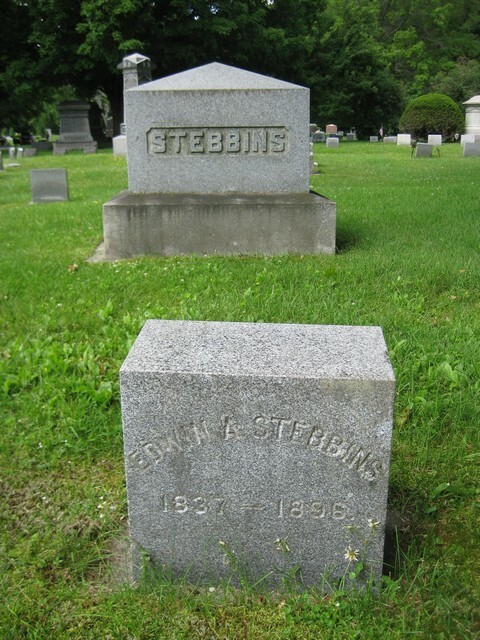 Stebbins was born in Brookline, Vermont on July 10, 1837 to Rufus Stebbins and Clarrissa Blandin Stebbins, the next to youngest of thirteen brothers and sisters. He attended the Round Schoolhouse in Brookline, as well as Leland Seminary in Townshend and academies in Springfield, Brandon, and Ludlow. As a young man, he taught penmanship. Stebbins studied dentistry with Dr. E.M. Bissell and began his own practice in South Londonderry, Vermont in the winter of 1860-61. Dentistry at this time was primitive, but Stebbins was known to have a keen interest in the profession by developing new techniques throughout his career. Corporal Stebbins has his wife here and has built him a little house so that he has things really nice for army life, seems like living, sit down to a table and eat like folks; Mother you will remember Stebbins the dentist - the very chap -; has been very sickly in camp . . . The Civil War journal of Nelson N. Wandell, 9th Reg., Co. K, also refers to Stebbins. Jane Stebbins is referred to in a June 19 (no year stated) letter written by Aaron Kellogg of the 11th Reg., Co. G. Stebbins himself kept diaries for the years 1862, 1864, and 1865. As the war wound down in 1865, Stebbins stayed on when others were discharged and at this time was assigned to the 11th Reg., Co. D. During this time, he also served as Post Quartermaster at Fort Foote and Quartermaster of the Battalion. Throughout his Civil War service, his orderliness, attention to detail, and educational background appear to have resulted in many administrative duties. Jane Stebbins died in 1877 and Stebbins was remarried in 1878 to Anna Adella Smith, with whom he had two children, George Edwin and Lucy Annette. 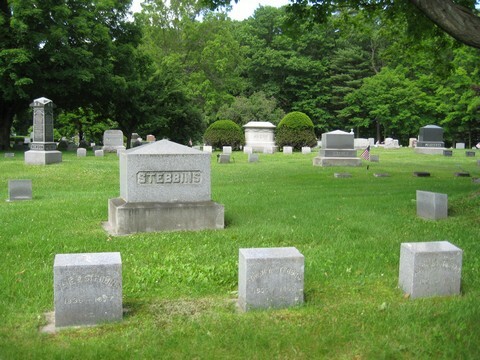 Edwin Stebbins' younger brother, J. Webster Stebbins, served in the 9th Reg., Co. K. Their nephew, John Barrett, also served in the 9th Reg., Co. K, and their cousins, Samuel E. Stebbins and Alonzo Holland, were Vermont natives who both fought with the 1st Minnesota, Co. K.
Glazier, Nelson Newton. Letter, 6 April 1863. Available from http://vermontcivilwar.org/units/11/nng4.php, accessed 29 Nov 2002; Internet. Greenlee, Ralph Stebbins and Robert Lemuel Stebbins. The Stebbins Genealogy. 1904. Hemenway, Abby Maria, ed. The Local History of Brookline, Vt., in Vermont Historical Gazetteer: Local History of All of the Towns in the State, Civil, Educational, Biographical, Religious, and Military, Vol. 5. Chicago: Press of Jameson & Morse. 1886. Aaron Kellogg Letter, 19 June (no year stated); Available from http://vermontcivilwar.org/units/11/kellogg-ltr.php; accessed 29 Nov 2002; Internet. Stebbins, Edwin A., 11th Reg., Co. G, compiled service record, National Archives, Washington, D.C.
Stebbins, Edwin A. Stebbins, 11th Reg., Co. G, pension record, National Archives, Washington, D.C.
Wandell, Nelson N. "Civil War Record of Co. K 9th Vt. Vols. June 4, 1862-June 23, 1865." 1999. Brooks Memorial Library. 26 Nov. 2002. Available from http://www.state.vt.us/libraries/b733/brookslibrary/journal.htm; accessed 26 Nov. 2002; Internet. Edwin A. Stebbins, 11th Reg., Co. G, wrote this letter to his family in 1892. His family consisted of his wife, Anna Adella; his son, George, age 10; and his daughter, Lucy Annette, age 9. It appears to have been written on the occasion of the 26th National Encampment of the GAR, which was held September 17-24, 1892 in Washington, D.C.
Mama's letter of 16th just rec'd. Glad to hear such good news. - that you had so good [a] time at WCTU & at Cattleshow. Probably the children got on just as well as if we had been there. I'll give an account of our Sunday service when I get home. It was delightful. This morning we went to the Capitol, Mr. P. and I ascending to the first landing on the dome & the others to the top. After leaving the Capitol the rest went to the Treas. Dept. and I to Vt. Head Quarters. I find that the 16th Vt. boys are to dedicate a monument at Gettysburg Friday, leaving here 6-30 A.M. Perhaps Mr. P. and I may go with them and from there to Baltimore instead of returning here. Have not decided when or by what way we shall return. If my letters come for me after our departure they will be forwarded home. Our party met at the White House from which we went to the War, Navy & State Depts. and thence to the Navy Yard and saw them making guns 40 ft. long with 13 in. bore or calibre weight 65 tons. - throws a shell weighing over 1100 lbs 13 miles. Costs $550.00 to fire it once. I thought some of taking it home for a 4th of July toy. I shall sit in front of White House and see the procession to-morrow. Dr. Perry and the boys leave for home at 11 - P.M. to-morrow, after the "fireworks". Mr. P and [I] shall look up our return to-morrow, probably. I'll go to look up the boys in the morning. Contributed by Bridget Bacon, great-granddaughter of Edwin A. Stebbins.